With the rise of voice technologies like Apple’s Siri, Google’s Ok Google, Amazon’s Alexa and Microsoft’s Cortana, marketers today are only beginning to uncover the most effective voice search optimization strategies in marketing. The voice search revolution is around the corner and voice command is on the rise. According to Hitwise, nearly 60 percent of all search engine searches on mobile devices are made with voice. 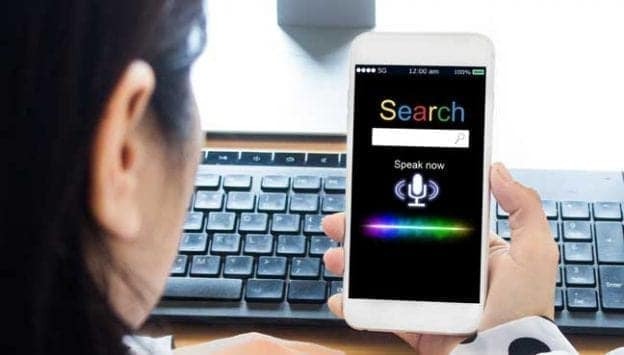 What’s more interesting is how we see voice search evolving passed our laptops, smartphones, and tablets; oozing into our speakers, TVs, watches, cars and even in our homes to just to name a few connected things. Voice search optimization is in its early stages, and early adopting search marketers have the opportunity to beat competitors to the punch. Why Voice Search Matters To Marketers? In 2013 Google released the algorithm update, Hummingbird. It splashed waves in the SEO community and marketers were forced to adjust their SEO strategies. Before, search was all about keyword strings and backlinks from other sites. Now with Hummingbird, Google went from “strings to things”; considering each keyword in each query, user intent and the overall relationships behind keywords; forcing webmasters to feed search spiders content in a more human manner. Instead of keyword stuffing, webmasters now must identify important keywords and also make connections to user pain points (points where conversions drop); increasing the chances that users will find a more semantically correct search result. In 2015, Google introduced artificial intelligence (AI) algorithm, RankBrain. Which helps Google come up with accurate search results for queries that it technically does not know. It does this by depositing large amounts of written language into mathematical entities called vectors for computers to understand. Why is RankBrain important to search marketers? With all the different variations a query can be phrased, combined with all the meaning variations behind each word, whether it be typed in keyboard or with voice search, RankBrain AI uses mathematical guesses to connect unique keyphrases to related keywords. And because it’s AI, it gets better with time. With 15 percent of queries being 100 percent unique to Google every day, RankBrain not only provides users with the next best possible options but also inspires search marketers to create more content that can rank for the other 15 unique variations Google has never seen before. Google also goes on record stating that RankBrain is the third most important ranking signal in their algorithm – that’s huge! Google dominates the search market, owning 74.5% of the search market pie. Search marketers have no other option but to cater to Google’s algorithm. Other notable search engines like Bing, Yahoo!, Baidu, and others together all hold only between 5% – 10% of the search market pie. To win the search war, marketers have to play on Google turf. Today it’s trendy to use voice commands. Voice search is already a popular gesture with users, and its growth rate is expected to increase as voice technology matures. ● 75% of adults between 18 – 24 use voice search for online content. Also, with the internet of things coming around the corner, it’s expected that by 2022 the average US household will have at least one voice activated device. In total that’s about 70-million devices. Marketers need to pay serious attention to voice search and learn how to leverage voice search strategies to their advantage. So How Do Users Use Voice Search? There’s a difference between voice search queries and keyboard queries. 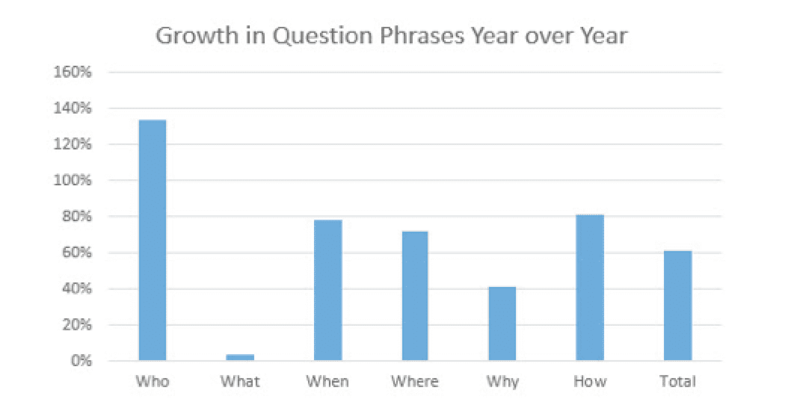 It’s also worth noting that since voice search hit the scene, question phrase queries have spiked 61 percent yearly. Sitting at the top of the question phrase movement are “who” questions. “Who” phrases skyrocketed up 134 percent and “How” phrases up 81 percent. Search phrase “near me” has grown more than 130% year after year. Users want digital assistants to know the best possible answer to their query nearest them. Whether it be “best cafes near me” or “best dentists near me” mobile users on the go want to know local content, whether it be in Manhattan or Los Angeles. Keep in mind that desktop searches and non-voice searches tend to type the region vs. using “near me” which is usually added to Google suggest as well as the region. Mobile users tend to say “near me” as noted by Google. 88% of “near me” searches are mobile and a growing trend on mobile as well. So optimize accordingly. With voice search queries being more conversational and stacked with question phrases, you’ll want to tailor your content so that your website answers questions in a more human way. So how do you answer questions in a more human way? Well, a good place to start is to listen and note how your customers ask for products and services in your store. If you’re doing keyword research for answer optimization, use tools like Question Samurai, StoryBase, and Answer the Public. From here you can tailor your content for voice search queries and create original pieces like a FAQs page, blog posts, free eBooks, infographics and even videos. It’s nothing complicated, just write like a human. With Google’s Mobilegeddon algorithm pushing the mobile search revolution into 2015, it’s never been more important for brands today to deliver mobile-friendly experiences. Sites that do not perform well on mobile tests like speed and responsive design will rank lower in 2018. You can use Google’s free mobile-friendly tool and also Google’s page speed tool as well to figure out if your website needs extra work. Most voice commands are made on mobile devices, so it’s without a doubt that Google will serve users the best possible mobile-friendly experience. The free tools mentioned above will provide useful insights that show you how you can improve your overall site speed. One of the most effective voice search strategies out there is local optimization. Voice queries tend to ask for local information. 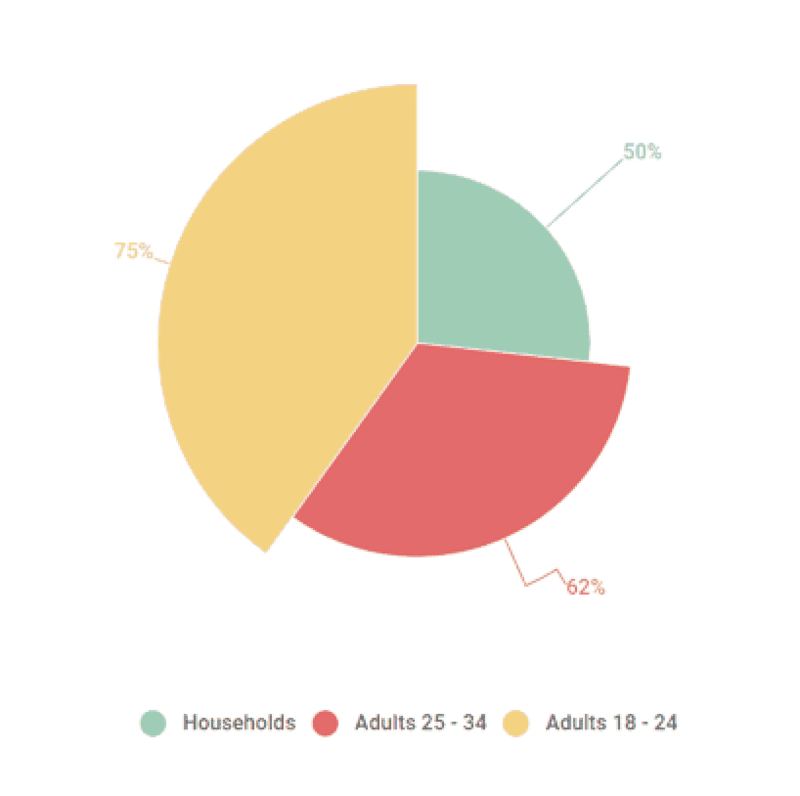 Start by brainstorming keywords that describe your niche industry and your neighborhood. Then create local pages that target those keywords. Be sure to also use the trending keyphrase “near me” in your title tags, meta descriptions, internal links and anchor text. Also, you’ll want to claim your My Google Business listing. It’s free, and with it, you’ll be able to show important information to searchers such as your business name, address, phone number, ratings, hours of operation, directions and your website. This will also help you populate Google’s prized Knowledge Graph. And remember: when you fill out your Google My Business listing, be consistent in how you use it on your website and in other local directories. Google rewards consistency. Whenever you fill out any business information online with any listing make sure your business name, address, and phone number are all consistent. This signals to search engines that your business is legit. When businesses show inconsistency on the web, it makes their business look fake, spammy or even hacker-ish. Even the slightest mistake can lower your SEO score. Web pages with schema markup have an advantage over websites without schema markup. Pages with markup give search engines a better understanding of a webpage’s content and most importantly its context; pacifying to Google Hummingbird and voice search. When you markup content properties in your source code, you’ll get to take advantage of Rich Snippets and Rich Cards, which help with voice search and conversion rates. 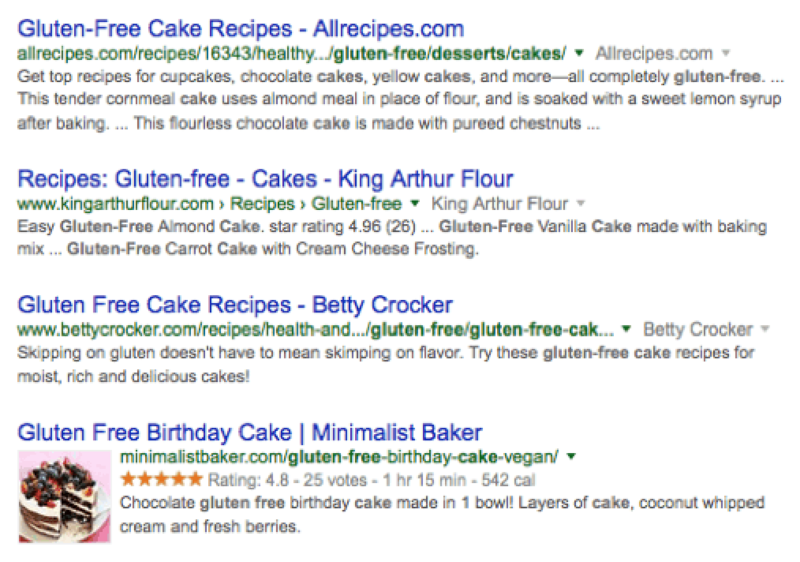 The example below shows you the difference between search results with rich snippets and results without. The SEO world is on the cusp of a voice search revolution. The voice technology we have seen in sci-fi series’ and films is finally here. And yes, it’s hard to keep up with technology in the marketing world. The voice search strategies I mentioned above will give you a leg up on the competition. Remember to target local queries, create content and pages on your website that answer question phrases, and be sure to take users to fast and mobile-friendly websites that have marked up pages. If you can think of one or more effective voice search strategies that are not on our list, feel free to share your insights below and leave a comment in the comments section.